I finally managed to nab another of the scant Nick Lowe albums in the used bins where I stretch what little of my music buying dollar I have. I now own a less-than-impressive four Nick Lowe albums. One from his “classic” era. One from his “middle period” and two of his “elder statesman” albums that commenter Tim favors so much. The very title marks this one as being conspicuously concerned with the artist’s maturity, so the rocker that made “Jesus Of Cool” is nowhere to be seen here; nearly 30 years later. I have the follow up album to this one, “The Old Magic,” an don that one, it sounded to me like Nick was interested in exploring the territory that Nat “King” Cole had staked out over 60 years ago. This one, while just as mellow, had its nose buried deep in the countrypolitan playbook with the scant, minimal accompaniment expending the least amount of energy necessary to keep the whole shebang afloat. Front and center was Nick’s warm, approachable vocal, with Steve Donnelly’s minimal lead guitar barely leaving a melody in its wake. Similarly, the piano of Geraint Watkins conjured up the essence of Floyd Cramer with the least amount of notes necessary. This was relaxed music that was all about the lowest expenditure of energy possible. While most of it favored a countrypolitan slant, there were exceptions. The great horn section got to carry a lot of water on the track “Hope For Us All” when the sound shifted, subtly, into Memphis Soul thanks to the winning horn section of Matt Holland on trumpet and flugelhorn, and Martin Winning [no, I didn’t know his name before I looked it up] on tenor sax and clarinet. I enjoy the mellow Nick as much as the rocking Nick, but I have to admit that I much preferred the subsequent album, “The Old Magic” [in spite of this one having an infinitely better cover]. Hitting the 1968 countrypolitan target was not as impressive an achievement to these ears as 1961 Nat “King” Cole’s style on the later album. It is astonishing to hear a performer owe up to his aging as the cover clearly makes plain here, and for that Nick is fairly unique. 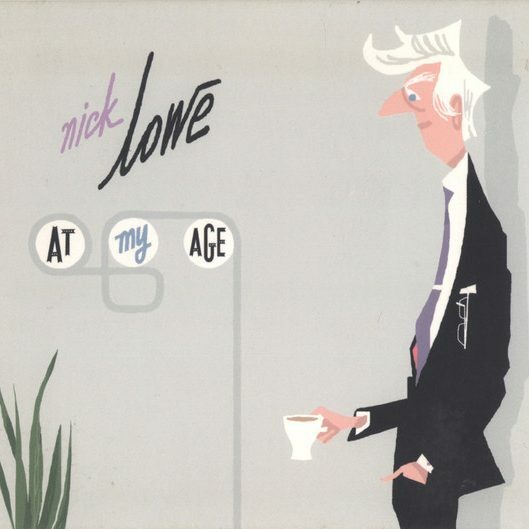 This entry was posted in 30 Days - 30 Albums, Record Review and tagged 2007, At My Age, Nick Lowe. Bookmark the permalink. diskojoe – Charlie Rich? Yep. I hear it. Being a keyboard guy, I notice the Floyd Cramer influence first but Hargus Robbins [Charlie Rich pianist] certainly had bore Cramer’s influence. Furthermore, Nick has the hair to be the new Charlie Rich! Hey! John Denver is cool; John Denver’s always been cool. I enjoyed your write-up, PPM. I am fond of this album, however The Convincer is the acme of his middle age mellow guy output. Apologies for not posting often, we lost internet where I live due to flooding, my provider tells me they have no idea when service will be restored. Right now my core internet access is lunch at work. Tim – No apologies necessary! I am the host. You are a guest. Any apologies to be made are my onus. And I’ve done it on occasion. And John Denver is cool especially for being dragged up in front of Congress during the PMRC hearings as a potential tool to smack those wicked rock stars with by Tipper Gore only to turn on his inviters and to eloquently side with the necessity of freedom of expression without government control. Word! He was perfection in the late ’70s. There were some hiccups in the ’80s, but every album had at least some endearing qualities, Everything since the Impossible Bird in ’94 has been just about impossible to cut up. Will finally be seeing him with Los Straightjackets for the first time in about two weeks. Can’t wait. Brian – Prepare for sheer enjoyment! They are two great tastes who taste great together!